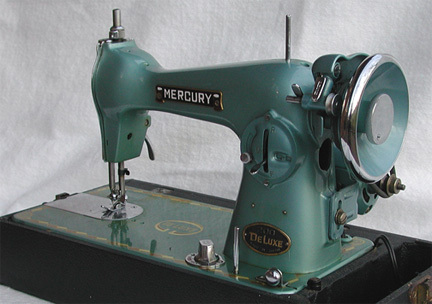 Our Mercury Deluxe Sewing Machine was purchased at Point Pleasant Goodwill December 2006 for $5.00. It was priced originally at $10.00 but when I pointed out to the cashier that there was no foot pedal she marked it down half-price. The machine appears identical to our Universal machine except for the color and faceplate design. The Mercury has many nice features. It has forward and reverse straight only lockstitch with the same control also regulating stitch length. The feed dogs can be raised and lowered using a knob on the base. The motor uses a standard two-prong electrical plug. Our machine is not serviceable at the time of this writing while we search for a foot control. We are also missing the light which mounts behind the round decorative rear access plate. 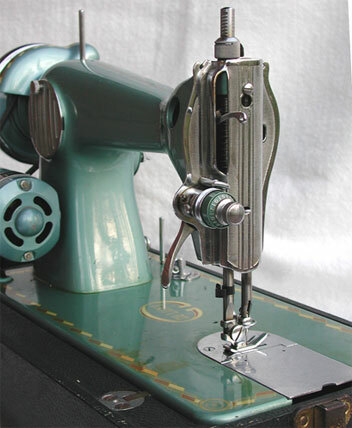 The Mercury machine was made by the Goodrich sewing machine company in Chicago, Illinois. They basically made copies of other companies machines like The Singer's New Family and a variety of Domestic's and National's vibrating shuttle machines. A lot of them went for Export to Europe. This info Comes from Charles Law his Encyclopedia of Antique Sewing Machines - third edition.